Global warming, natural disasters and extinction aren’t bad news for everyone. They open up new frontiers for financial markets in terms of investment but also on a infrastructural level. Financial markets can quantify and price everything. 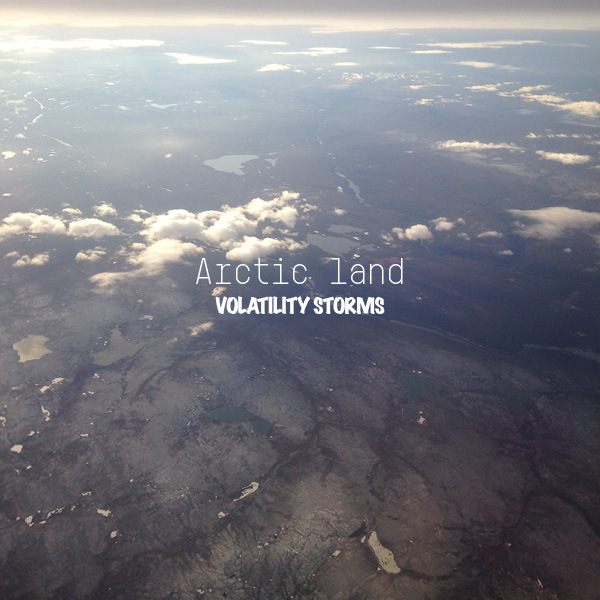 The melting Arctic ice uncovers new lines for trading algorithms, future hurricanes are compressed into CAT bonds, endangered species are vaporised into speculative financial products. For traders it is not relevant if and why places become colder, dryer, wetter or stormier, it is the rising weather volatility that counts. Rising weather volatility generates an increasing number of events which means more opportunities to speculate. Catastrophe is a safe bet. 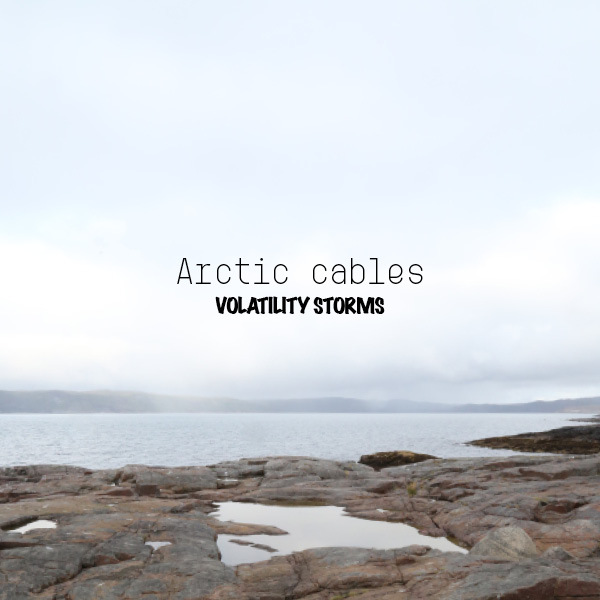 ARTIC CABLES – The future Arctic is described as the discovery of a new continent with untapped resources, exotic ecosystems and new trade lanes. Global warming will literally open up faster routes for trading algorithms in the Arctic. The melting ice will make it possible to lay submarine cables onto the Arctic sea floor. These Arctic submarine cables will be solely constructed for increasing speed. In the near future should shortcut the data connection between the financial markets of London and Tokyo that are now linked via the Middle-East and Pacific. Latency is expected to drop substantially, data traffic is expected to be 30% faster. Less ice means more – and faster – money. ARCTIC LAND – “The best investment opportunities in the last 12,000 years,” is how investors are describing the Arctic region. For financial markets the Arctic is the Next Big Thing: a new frontier of imagination and investment opportunities. Melting ice will make massive gas and oil fields in the Arctic sea more accessible, will make the now frozen tundras suitable for agriculture and valuable minerals of which the Arctic is rich – such as sink, iron, gold and nickel – more easy to mine. Investing in the Arctic brings along massive financial and ecological risks, but financial markets thrive on risks. Currently investors are trying to get a foothold by making Arctic land deals and planning new infrastructures. Participating in the Arctic chess game will make a lot of people rich. CATASTROPHE BONDS – On October 18th 2014 Hurricane Ana is expected to hit Hawaii. When it does is can create big profits and losses in the financial markets. Catastrophe bonds turn floods, volcanic eruptions, hurricanes, earthquakes, tsunamis into financial products. Financial risks from natural disasters are highly concentrated in a few places. With a rising weather volatility and number of natural disasters, insurers and governments increasingly have problems covering big catastrophic risks. Instead they sell catastrophe bonds to spread the risk. The buyer of this bond invest his money in a catastrophe insurance and loses it all when a specified natural disaster happens within a predetermined number of years. This way the seller ensure himself against extreme losses and pays the buyer a high interest rate. Spreading risks in broader markets via cat-bonds is like distributing an earthquake of the highest level across the planet so no one will feel it. 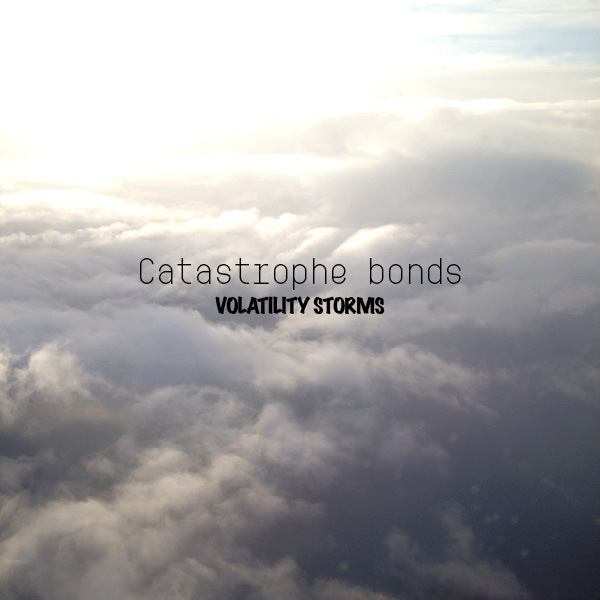 Cat-bonds deal with rare events and there’s a great uncertainty involved, yet when a natural disaster hits it hits hard. These moments of disruption are perfect for investors: taking very high risks can return a lot of profits when the coin fall on the right side. 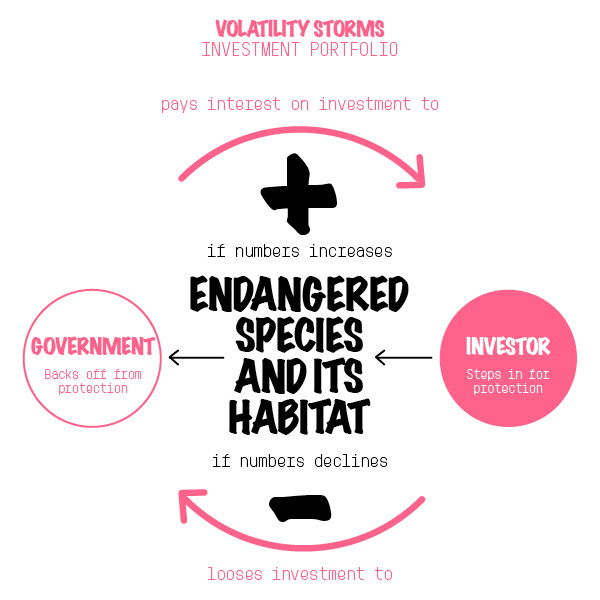 SPECIES SWAP – It can be profitable for speculators to contribute to the depletion of animal stocks thereby speeding up the extinction process: e.g. Atlantic blue tuna fish are frozen in anticipation of future prices. When going extinct stockpiles of a specie (or its body parts) become of infinite value. 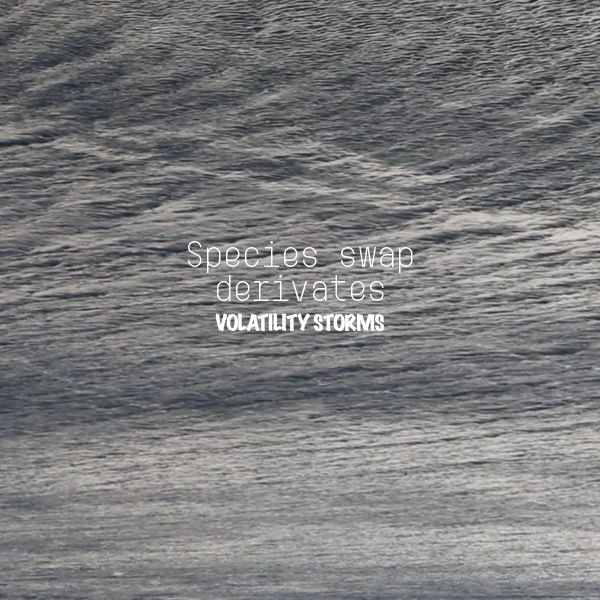 New anticipated financial products – the so called “species swap” – are derivatives that should preserve endangered species. Fiscal and debt crisis withhold states back from investing in biodiversity and gives way to the financialisation of animals. Species swap contracts secures the efforts of investors to look after a specific habitat of an endangered species. If the species goes up in number the state pays the investor interest, if the number declines the state receives money from the investor. Species as renewable or non-renewable resources, betting on extinction or survival works either way. 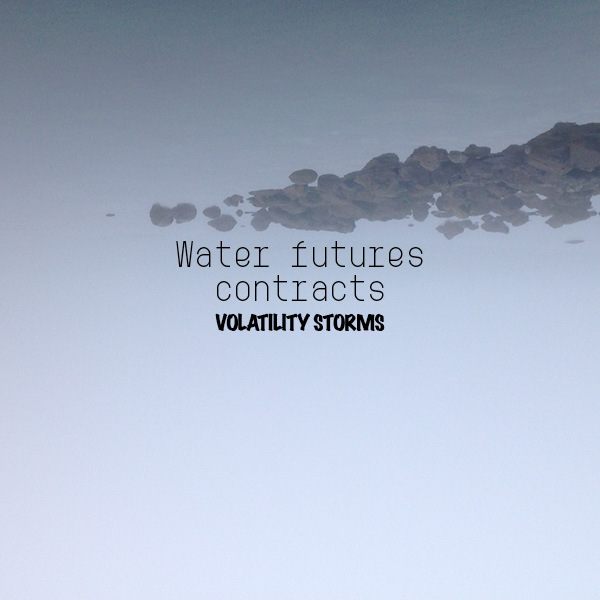 WATER FUTURES CONTRACTS – The oil of the 21st century is too cheap and undervalued, and governments have only started to realise this by criminalising the harvesting of grey water. Collecting rainwater is, for example, illegal in the US and will put you in jail. Investing in water companies and infrastructure helps securing its value in the future, just as making land and water deals in undeveloped areas of the world. Yet, trading water as a commodity opens a new perspective for international financial markets. Usable water will become scarce and will need to mined, processed and stored. Local shortages and surpluses around the world and the highly political prices that differ per country creates a need for water to be moved around the world. This generates a competitive landscape for a international water futures market. When water is disconnected from its local territory and its ownership can be traded in exchanges, then water truly becomes liquid, global and directly convertible to cash.